Extending the growing season involves creating a warm, sunny environment for plants to actively grow. Cool weather crops such as spinach, peas, and lettuce will germinate and grow in cooler temperatures and lower light levels than warm weather crops such as tomatoes, peppers, and melons. It is not really cost-effective to grow warm-season vegetables through the winter, as heating a greenhouse and/or using supplemental lighting is very expensive. But for much of the United States, the growing season is so short that starting some of these crops early is the only way for people to harvest much before the first fall frost. Most gardeners start tomatoes, peppers, and eggplants inside their homes a few weeks ahead of planting time – either in sunny south windows or under grow lights. Unless you have a very short growing season, it is not usually worth starting melons or squash indoors. Plants grown from transplants take a while to start growing in the garden, because it takes time to establish their roots into the soil. So, if you start plants indoors 4-6 weeks early, they will often mature only 2-3 weeks faster than seeds planted directly into the garden soil. Melons and squash grow so fast that they can only tolerate growing in pots for about 3 weeks, so transplants don't usually ripen faster than direct-seeded plants. However, if your frost-free period is a little too short to ripen these plants – even if you use a cold frame to pre-warm your garden bed – then starting them inside might be the only way for you to get a crop at all. While you can extend the growing season of your warm weather crops by covering or protecting your plants in the garden, these crops often don't thrive in cooler weather and cold soil. If you wait to plant warm-weather crops into the garden when the weather and soil have fully warmed up, they will often produce as well or better than plants that have had to struggle to grow for weeks in cool spring weather. This is particularly true for sweet potatoes. If possible, I recommend that you wait to plant your main warm weather crops until the soil is warm (at least 65-70 degrees), which is usually within a couple of weeks after your last average spring frost. The soil in raised beds just 2-6 inches high will warm up and dry out faster than level garden soil. But higher beds than that is not necessarily better. In 2011, I experimented with small 20″ high raised beds (to accommodate my disabilities) and I discovered that the soil in these very high beds stayed solidly frozen for two weeks longer in early spring than my 6″ high beds. Soil will warm up much faster when covered with row covers, clear plastic, or a cold frame. Remove any mulch and cover the raised garden bed at least 2 weeks before you want to plant in it. Once planted, keep your young plants covered during cool weather, to give them a warmer environment to grow in. Always uncover them when they start blooming, to allow insects to pollinate the flowers. The time it takes for plants to ripen varies widely between different varieties. Early tomatoes, such as Stupice, might take only 60 days, versus 85 days for late varieties. Early watermelons can ripen in just 70 days, versus 95 days for late types. For my earliest crops, I select varieties that can grow well in cooler temperatures, such as Blacktail Mountain watermelon. I also try to select varieties with excellent flavor, which is often harder to find in early types of warm-season vegetables. I grow only one or two early tomato plants. These I start indoors around March 1st. I set up water cloches, such as Wall-O-Waters, on the raised beds on April 1st, and plant the early tomatoes inside them on April 15th. Even though I put these plants in the garden four weeks earlier than normal, they will only ripen about 2 weeks before normal. My early tomatoes will start ripening around July 1st, and will tide me over until the main crop starts ripening 6 weeks later. It is more difficult to extend the growing season of warm-season crops past the first fall frost. Most of these plants are quite large and difficult to protect against frost damage. They also will not grow as well in cooler weather and shorter daylight hours. You will have to experiment to find out which methods or varieties will work best in your garden and climate, and how much effort you are willing to put into extending your natural growing season. It is a lot easier to extend the growing season of cool-weather crops such as lettuce, spinach, carrots, beets, green onions, cabbage, and more. These plants can thrive in colder weather, even tolerating repeated frosts. 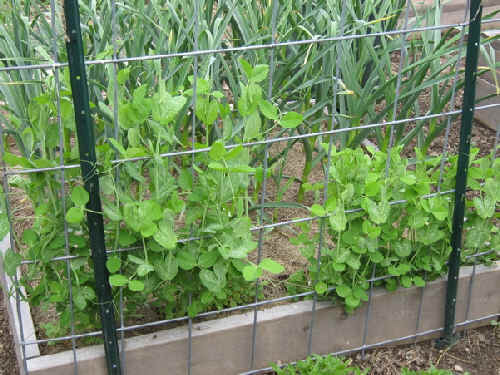 And it is very easy and cheap to give them some protection – with either row covers or cold frames – that will allow them to actively grow several weeks earlier or later in the growing season. Even within cool-season crops, it is possible to select varieties that are more tolerant of colder weather. Be aware that cool-season crops planted several weeks earlier than normal will grow more slowly than plants started when the weather is warmer and daylight hours are longer. I've noticed that peas planted on March 15th generally ripen only 2 weeks earlier than peas planted on April 15th, even if they are given extra protection. If I want to harvest peas for the longest period of time in spring, I'll plant my earliest variety (50 days) in a cold frame around March 15th, and then plant a later variety (62 days) in an uncovered garden bed on April 15th. The early variety will start producing around mid-May, and will last until the late crop starts ripening around mid-June, giving me close to 8 weeks of total harvest. Choose varieties bred for warmer weather. They will not be as sweet as those maturing in cold weather, but you might still enjoy them enough to be worth the effort. You will have to experiment to see what will work best for you. I love my winter spinach so much that I never bother trying to grow it in warmer weather. I instead grow Swiss chard and other summer greens in hot weather. Choose varieties that mature very quickly, and grow them in fertile soil with a steady supply of moisture. It's very important that you don't let them dry out! Low nutrients or water levels can slow plant growth and cause poor flavor and tougher plants. Example: turnips usually taste a lot better if grown in the fall, but I have raised small tasty Japanese turnips that mature in just 35 days very successfully in the summertime. Give cool-season crops partial shade to reduce the heat – either heavy shade during the afternoon heat, or cover them with light shade cloth, latticework, a couple of layers of cheesecloth, etc. for the entire day. They will need good ventilation to not overheat in the sun. Many greens and root crops will produce good crops with just 4-6 hours of direct sunshine or with light shade throughout the day.